City of Brass is all about greed. Naturally, you love pilfering shiny and sparkling trinkets, but just how close will you tread into the unknown to sate your desire for wealth? Will your avarice help break an age-old curse and claim limitless riches, or condemn you to an eternity of torment? It’s an intriguing premise, and one that fits the oft-used roguelike template like a freshly-stolen glove. City of Brass takes that tantalising prospect, wraps into a mythical Arabian shell and leaves it for the taking on Nintendo Switch. While its sand-swept streets and shining towers may remind you of musical numbers and cartoon flying carpets, we can guarantee this is no Disney-themed adventure. The titular city is a nightmarish metropolis filled with treasure, traps and monsters in equal measure. With only a Castlevania-style whip and a bladed weapon to your name (and an unhealthy thirst for silverware), this first-person roguelike sets you a simple task: reach the centre of the city. Any riches you find on the way are yours… if you can survive long enough to spend them. Every time you enter one of its districts, the layout is randomly changed so you’re always on the back foot. Should you die – and you will, more often than not – you’ll keep your XP (accrued from defeating enemies and collecting treasure) but lose all your coinage. The key is to know when and where to spend your cursed cash. Scattered throughout the city’s courtyards, corridors and dungeons you’ll find lamps and the genies that lurk within. Each one offers a select number of buffs to buy, if you have the coin to trade. Each one – complete with their own unique honorific moniker – functions in a similar fashion to the vending machines from the BioShock games. Some will grant you an extra heart of life, others will increase your speed and some might even outfit you with some nasty implements of death-dealing destruction. 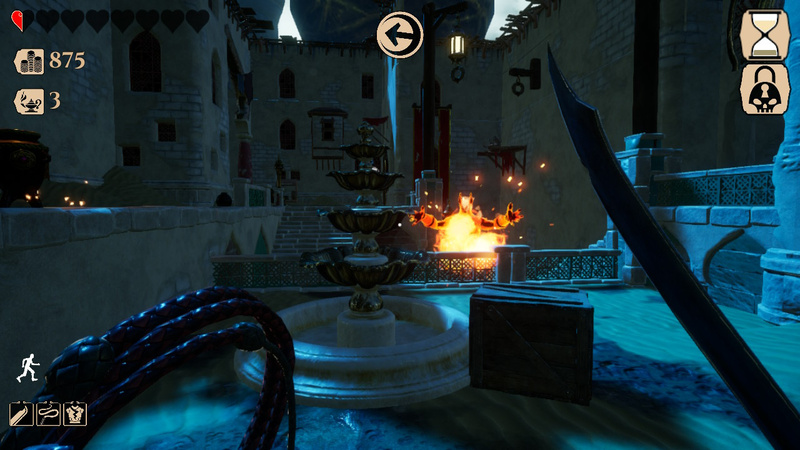 Augmentation and experimentation play a big part of City of Brass’ gameplay loop, with randomised bottles imbuing you all manner of powers and transformations. One might freeze all enemies in the vicinity – ideal for making quick progress to the end of that district – while another might turn you into a defenceless chicken. You can even select a number of Burdens and Blessings from the main menu in order to adjust the difficulty of each procedurally-generated run. Enemies can be made less aggressive, your own damage output increased or the number of traps reduced. Inversely, you can halve the time limit ticking away in the background, activate enemy respawns or plunge the city into perpetual night (making traps and foes far harder to see when entering a new area). Doing so will force you to forgo an entry on the leaderboard with your time and gold haul, but it does add in some considerable replay value for those looking to make a playthrough easier, or far more challenging. If the first-person perspective, danger-filled labyrinthine maps and setting depicting a utopia fallen into ruin wasn’t enough of a clue, it probably won’t surprise you to learn the studio behind this plucky indie, Uppercut Games, has filled its ranks with developers with experience on both BioShock and BioShock 2. 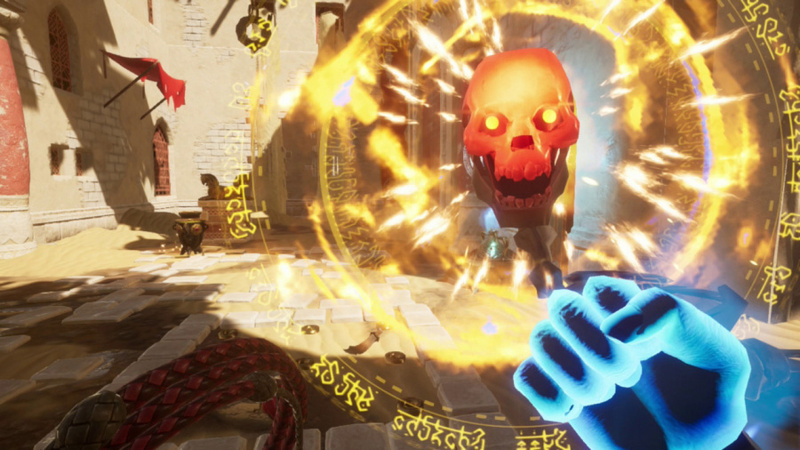 And while the titular metropolis doesn’t come close to imitating the atmospheric grandeur of Rapture, City of Brass makes up for it with the sheer creativity you can unleash when traversing its map, and in combat. This is where the real fun begins. Your whip (which comes in multiple, collectable varieties) can set off traps from a distance or smash vases, boarded up doorways and other sun-baked detritus. It can even be used to pull items towards you with a press of ‘L’. In combat, you can flick your whip and take an enemy’s legs out from underneath them, slap away their weapon or crack them in the face to temporarily daze them. 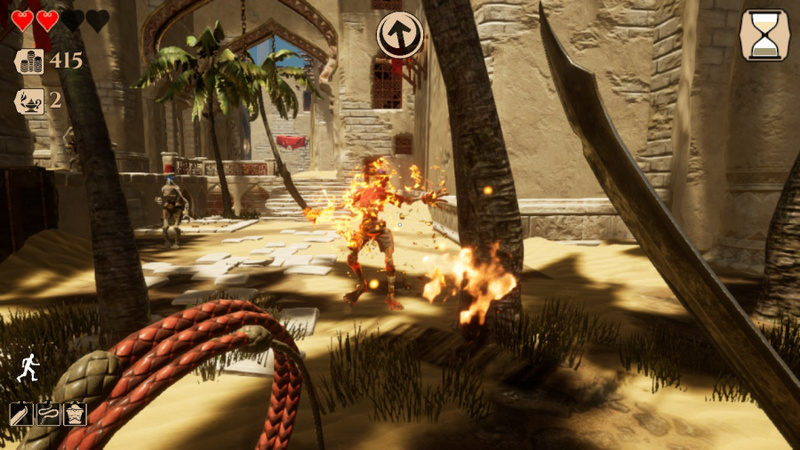 You can pull enemies into floor traps, whip nearby fire braziers or lamps to cause them to explode, and more. There’s even the option to briefly swap your sword for an explosive vase for some makeshift firework action. It’s reminiscent of Bulletstorm’s rewarding push/pull mechanic, and makes combat as fun as it is intense. Those procedurally-generated maps can sometimes be hit-and-miss, as with all games that rely on a randomised element. More often than not, you’ll get a map that’s filled with hidden chambers laden with traps or open courtyards with enough cover to take out fire-launching archers, but you’re going to have to contend with some that seem determined to kill you with unblockable dervishes or meagre treasure drop rates. Still, grabbing all that loot will take you back to the good old days of Thief (although a little more overt support for stealth wouldn’t have gone amiss). 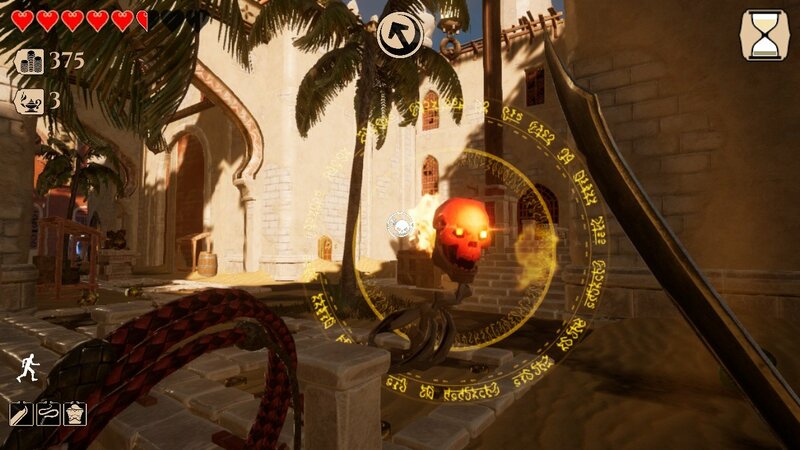 While some of its procedural generation can sometimes make for an unnecessarily challenging experience, City of Brass more than makes up for it with the sheer creativity you can have exploring its Arabian Nights-themed maps. With genii to imbue you with wacky powers and the ever-tantalising need to collect more gold (as well the option to compete with others via the leaderboards), Uppercut Games has produced one of the most entertaining roguelikes to swing onto Nintendo Switch. And you can throw ghost chickens. What more do you need?